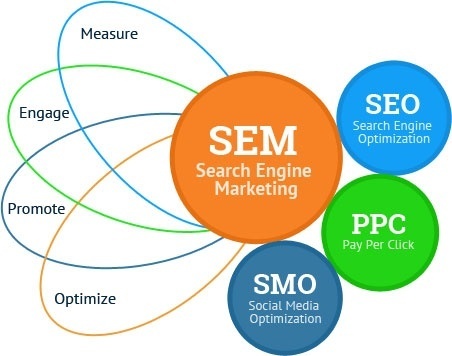 Search Engine Marketing or as we can say SEM is very important because this effective tool will help in the growth of the business in a marketplace that is very competitive. There are several businesses who are working day and night to implement the best strategy. To get the boost you will be needing the right advertisement and all the other marketing strategies that will help you to get the attention from potential customers. Search engine marketing is known to be a great way of promoting the product and growing the business. Search Engine Marketing is very important because it helps in generating web traffic. It helps in complimenting the content marketing with SEO for helping the brand to get the top position in the Google ranking or any other such search engine rank. You can say that SEM is basically used as the umbrella term of all the other marketing tools that are used online. If you know the difference between SEM and SEO then you will know that if SEM is most commonly used for indicating the paid advertising that takes place within the search engine. In the process of Search Engine Marketing, you will be able to learn about several acronyms and synonyms which are related to search engine marketing. This particular thing may create some perplexities for beginners. SEM is basically the paid searches and some of them are paid search ads, cost per click, pay per call, pay-per-click, cost per thousand impressions and many more. Not everyone is aware of the working procedure of search engine marketing and that is why they are hiring several professionals who will change and structure the website accordingly. If you are looking forward to some SEO or any social media tools which is unpaid then it will definitely take time for creating brand awareness. To gain the quality ranking with the high scale you will have to wait for more than a year but with the help of SEM your website is going to be on the first page of the search engine and at the top position or at the bottom position. Even if your brand is not having enough recognition it can still get some quick attention. Everything is quite scalable if you have SEM because starting with SEM is very easy. SEM will be increasing the ads count and will remove the ads which are not working for your website. The search engine is going to drive more potential customers to the website so it is very important to use SEM for getting the online visibility. Nowadays every small and big company are looking for proper marketing strategies and tools that will help them in getting online visibility and increase their sales graph. With the help of Proideators, you will be able to explore several opportunities and get full-fledged knowledge related to Search Engine Marketing. Our prime goal is very focused and clear. We will help you in achieving your goal along with all the aspirations in your life. If you are looking forward to building a career in Search Engine Marketing then you should contact us today to begin the journey.